I was really challenged by the idea of anyone pulling off a true MMORPG on iOS devices. who is going to be the first company to bring something like World of Warcraft to the iPhone. Well, Gameloft is definitely up to the challenge with the game “Order & Chaos Online” . First I will tell you some details about this iPhone app, and let you know the distinct features that make the iPhone game worth playing on your iPod Touch. There is not much of a story in Order & Chaos, you seem to be mostly questing. There are two defined story lines. You can fight for order or for chaos. You choose from four races to design your character, and you can design up to four characters on one account. The races are the humans and elves fighting for order, and the orcs and the undead fighting for chaos. You can choose male or female for any class. You can chose warrior, mage, monk, or ranger, each with specific abilities of skills. You can customize the various aspects of your character such as hair, body style, and gender. You log in with your Gameloft account, and you choose a name and design for your character. There are 4 different servers to chose from. Order & Chaos provides over 500 quests, 1000 different skills you can learn, and 2000 different items to find. This is outstanding for a portable game. There is a basic fantasy type world, full of creatures for non-stop battling. The graphics are great, and it is a universal app for iPad and iPhone. The graphics scaled for each version to avoid it from being stretched on the iPad. The app’s file size is more than half a gigabyte so you’ll want to make sure you’ve got enough free space on your iPhone or iPad. 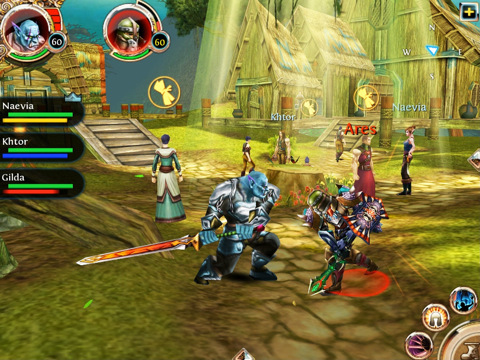 The combat is auto-combat style, with a mixture of turn based action. Your character will automatically attack anyone who attacks you, however you will control the attack based inputs after that. The controls are fairly simple, with a stick to move around and a simple jump button with three attack slots. The controls in Order & Chaos are very responsive, leaving small room for error. When you encounter a character, you can attack them and loot their bodies, or simply communicate with them. The gameplay is online, so you will see a mix of NPCs and human characters. You can join guilds and fight battles with friends. You can also start temporary guilds for quests and player versus player. You can send a message to any person who is online. When you touch another player on the screen, you can send them a message or invite them to a quest. The menu system is great and easy to understand. Order & Chaos organizes your character well with skills, and equipment displayed clearly. It also allows you to manage your friends and guilds. You pay $7 for the Order & Chaos app and you get 3 free months of gameplay. It is then only $0.99 a month after that, with cheaper plans for long-term players. Sale: For Father’s day 2011, Gameloft slashed the price of the Order & Chaos game to only 99 cents, so grab a copy while it’s on sale if you can. 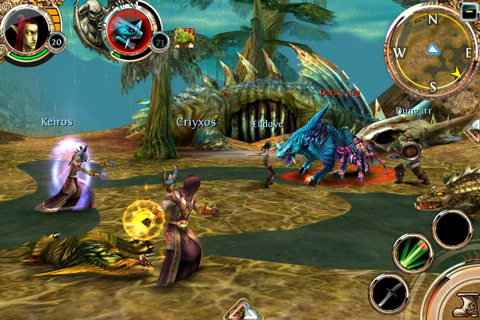 AppSafari review of Order & Chaos Online was written by Darius Reimm on June 17th, 2011 and categorized under App Store, Featured, Games, iPad apps, Multiplayer, Strategy, Universal. Page viewed 6671 times, 1 so far today. Need help on using these apps? Please read the Help Page. Muy conforme con los servicios que prestan y con la calidad y excelencia de sus productos estoy esperando los nuevos lanzamientos de La Marca. Mis mas francas Felicitaciones. A la espera de vuestra respuesta les saludo muy cordialmente.